Here is an entry I did post a PD/workshop I co-lead in relation to art education NOW & #blacklivesmatter. 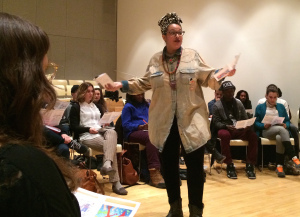 Author Tiffany Jones reflects on the recent Teaching Art Today: #BlackLivesMatter Teach in held at the New Museum on March 19, 2015. Teaching art today is an opportunity to discuss life and all its complexities, while providing an outlet and the skills for students to communicate a message. Art provides students with a pathway to healing, empowerment and advocacy. Art makes their thoughts visual thereby making the artist visible, hard to ignore. Therefore as art educators I invite us to be agents of change, who explore hard issues like race in our space of learning. injustices like police brutality. Race is a Goliath and it’s not only your task to address it.